First Line: "I feel sick to my stomach," Maggie Gerber said. Maggie's queasiness is understandable; she's just purchased her very own secondhand shop. Now all she needs is to hurry to the St. Stanley flea market and score big when wealthy Vera Madison sells off her vintage designer clothing. Vera's to-die-for clothing and accessories are just what Maggie needs to give My Sister's Closet a decided advantage over loathed rival Summer Phillips' own shop across the street. But it's not meant to be. Vera Madison is found dead, and Maggie's boss, Dr. Franklin, is the Prime Suspect. Maggie knows there's no way Dr. Franklin could murder anyone, but as she and the other Good Buy Girls soon find out, Vera Madison had lots of skeletons in her closet-- and more than a few enemies. Jenn McKinlay (AKA Josie Belle) is one of the few authors who compels me to read about things that don't interest me. She writes a series about hats. I could care less about hats, but I read and enjoyed Cloche and Dagger. 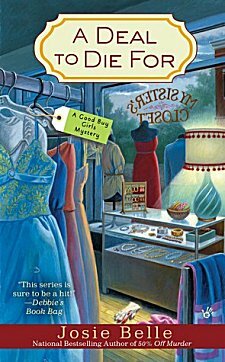 I don't enjoy shopping and/or bargain hunting, but I really enjoy this Good Buy Girl series. The main reasons for this are McKinlay's writing style, her sense of humor, and the characters she creates. In this series-- and this book-- two characters are standouts: Maggie Gerber and Summer Phillips, Maggie's rival. I'm tempted to say that Summer is too over-the-top, but I know women like her. Summer is guaranteed to raise blood pressure to dangerously high levels, and every time she appears on the scene, the first phrase that flits through my mind is "To the moon, Alice!" Maggie on the other hand, is the best sort of friend a person could have. Yes, she's got a temper, but she knows how to stand up for herself and others, and she genuinely cares about people. She and handsome Sheriff Sam Collins strike sparks off each other each time they meet, and it's fun to watch their relationship progress. The mystery in A Deal to Die For is a particularly good one. It twists, it turns, it doubles back on itself-- and many secrets are revealed about secondary characters along the way. There are no cardboard cutout folks in a Jenn McKinlay novel. I may never enjoy shopping, but I certainly am looking forward to the next adventure of the Good Buy Girls. Cathy - Hmm..shopping isn't usually my thing, but vintage stores are great. And this looks like a solid premise for a novel too. And the ongoing rivalry sounds like a great way to build tension in the series.